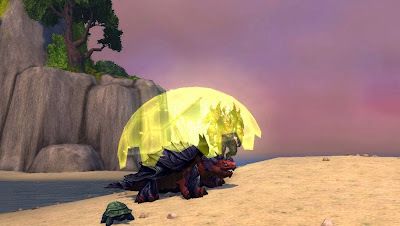 Master of World of Warcraft : Get your pet to attack while stealthed. Get your pet to attack while stealthed. their pet to attack whilst remaining camouflaged. They didn't explain the exploit, so I tried to reverse-engineer it. Feign death with play dead glyph. Immediately accept pop-up port (eg bg, proving grounds). Pet will now still be in feign death mode. Dimiss pet and replace it with another until the feign death buff expires (it will run down even when dismissed). Go kill stuff for six minutes. Recall original pet as feign death buff is about to expire, go into camouflage as pet is coming out of feign death. You should now be in stealth and your pet can attack anything without bringing you out of camouflage. With proving grounds you can set up five pets for a potential five minutes of this exploit per bg or whatever. The exploit is quite powerful but the set-up time and the fact camouflage lasts only a minute per pet limits its utility. I'm posting it partly as I suspect others can develop it further.